What video format can play on Sharp Smart TV via USB? I'm having issues streaming my 4K H.265 files to my Sharp Q8000U 4K UHD Smart TV. They play fine from a Windows 10 PC's Media Player. But I can't play it via my external drive. Why? I'll have to think of a way to solve the problem. We must find a way out. So Please help. We can watch favorite movies on TV in different ways, sucha s play Blu-ay and DVD discs on TV via BD player, play papular movies via Hulu or Netflix. In this article, we talk about watching H.265 movies on Sharp TV USB, which is more convenient and efficient to manage all of your Blu-ray discs, DVD discs, downloaded 4K or Full HD movies. What video formats can play on Sharp TV via USB or external drive? From Sharp's official website we learnt about smoe details. 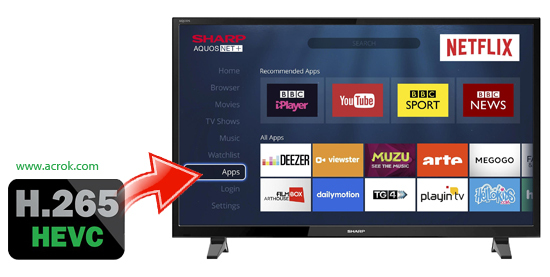 How can we enjoy these Sharp Smart TV unsupported formats via USB port or external drive? To copy H.265/HEVC to USB for watching on Sharp Smart TV, the easy and effective way is to convert H.265 to Sharp Smart TV compatible format initially. Indeed, a huge amount of converter apps out here are available for transcoding 4K or HD files to Sharp Smart TV supported video formats. But taking into consideration of converting speed and transcoding quality, here I highly recommend you try Acrok Video Converter Ultimate. The powerful H.265 to Sharp Smart TV Converter in this passage is highly recommended by millions of users, which can easily convert H.265 to Sahrp TV with only three clicks: Import the H.265 files, set the Sharp Smart TV playable format, and start the H.265 video conversion. Besides playing H.265 movies on Sharp Smart TV, this great H.265 Video Converter will transcode H.265 files to other TV like Samsung Smart TV, Apple TV, Sony TV, LG TV, Vizio TV, etc. In addition, it is available to convert H.265 to other devices like iPhone X, Galaxy S9, Blackberry Key2, OnePlus 6, Surface Go, Galaxy Tab Pro, Moto G6, LG G7 ThinQ, Google Pixelbook, etc. 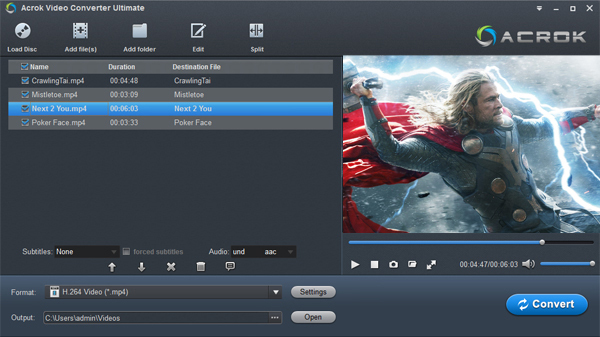 Moreover, it supports to convert other video format to Sharp Smart TV like convert Blu-ray, DVD, MXF, MP4, MKV, MOV, VOB, DV, MTS, M2TS, FLV, RMVB, WMV, AVI, Xvid, etc. This great H.265 to Sharp Smart TV converter also works as an audio extractor: extract audio file like MP3, WAV, WMA, AIFF, OGG, FLAC, AC3, etc. from video files like Blu-ray, DVD or MKV. How to convert H.265 to Sharp Smart TV supported format? 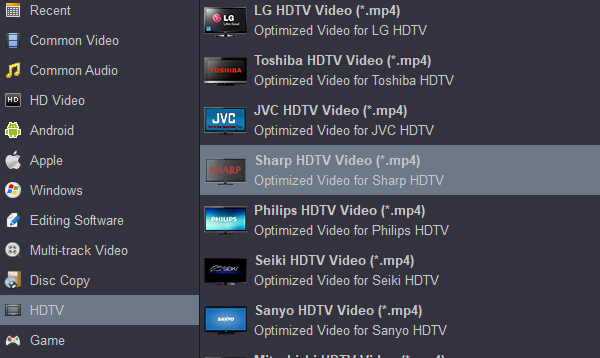 Run the Sharp Smart TV format converter, and click the "Add files" button to load 4K H.265 videos for conversion. If you would like to join all the selected files together, please click "Settings" button then check the box of "Merge into one". Click "Format" bar to determine output format. The powerful 4K Video Converter offers particular output formats for Sharp Smart TV. Just click the format bar and choose "HDTV -> Sharp HDTV Video (*.mp4)". Click the "Convert" button below the preview window, and the conversion from H.265 to H.264 MOV for Sharp Smart TV starts immediately. 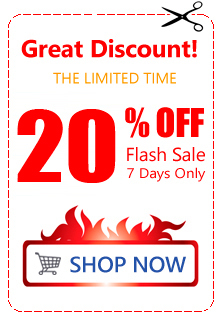 After the conversion is finished, just copy the converted videos to your flash drive. You can play the movies on Sharp Smart TV without any problem. So glad a found Acrok Video Converter Ultimate! Just having the trial, i was able to complete my video work. I highly recommend this software and plan on purchasing the full version tonight.